4 star crazy, surreal and very gory action horror. 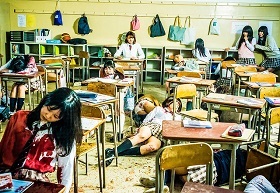 Tag is written and directed by Sion Sono (Tokyo Tribe, Suicide Club) and is a rollercoaster ride of surrealism, feminism and blood. Despite its fifteen certificate this film is most certainly not for the faint hearted. It is presented by Eureka in Japanese with English subtitles. Mitsuko (Reina Triendl – Seven Women in Prison, Kanna San!) is a happy go lucky schoolgirl with her head in the clouds who loves to write poetry. However, her life is completely changed one day as she is heading off on a school trip with her classmates. While she kneels down to pick up her pen, the wind blows so sharply that it slices the bus and all of her friends clean in half. The only survivor, she finds herself running for her life as this strange supernatural force pursues her. She somehow manages to find herself a clean uniform, but as she runs she finds herself walking to school with the friends she thought had been killed. Believing she has had a bad dream, her best friends Aki (Yuki Sakurai – Love That Makes You Cry), Sur (Ami Tomite – Antiporno, Tokyo Vampire Hotel) and Taeko (Aki Hiraoka – Lowlife Love) skip class to take her to the lake. Upon their return to school things once again begin to descend into chaos and Mitsuko begins to doubt the world around her, her sanity and even her identity. Who are Keiko (Mariko Shinoda – Re: Born, Terra Formars) and Izumi (Erina Mano – The Next Generation: Patlabor) and what do they have to do with Mitsuko? Tag is very cleverly written and sweeps you along with it from start to finish. It is quite often difficult to believe what you are seeing and the whole experience is very surreal and leaves you feeling slightly shell shocked. If you are a fan of horror and are not bothered by subtitles then this glorious gore fest should tick all of the boxes, just be aware that it is extremely strange but still well worth adding to your collection. Tag is available to buy now on Dual Format DVD and Blu-ray.